If you have not lived with Adult ADHD—in yourself or a loved one—it’s impossible to grasp the depth and breadth of potential challenges. That goes double when the diagnosis comes later in life. Over the years, what started (but was never recognized) as ADHD in childhood has morphed into a murky mix of symptoms, misinterpretations, negative feedback, and counter-productive coping responses. With parents and siblings. With teachers. With the world. And with the intimate partners. Everyone means well. Friends, family members, and even couple therapists. But their advice typically falls flat. It can even compound shame and isolation. Even well-qualified ADHD specialists struggle to extend their expertise to relationships. There can be a tendency to recruit the “partner of” as a secretary or helper. An untenable strategy, at best. Standard couple therapy won’t suffice. Individual ADHD therapy isn’t enough. What does that leave? A merging of proven principles from both couple therapy and ADHD therapy: Adult ADHD-Focused Couple Therapy™. —Re-discover the joy, fun, and attraction that brought us together? —Cooperate more reliably and harmoniously in parenting children, who might or might not have ADHD? —Communicate in a way that we both feel heard and understood? —Learn strategies to cooperatively manage time, money, chores, electronic devices, and….intimacy? —Better understand medication and how to work as a team with my prescriber? —Work together on strategies to improve organization around time, priorities, and “stuff”? You will find answers here at ADHD Success Training. 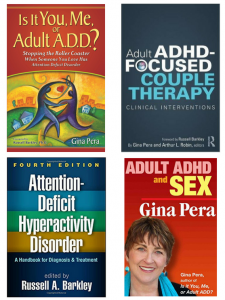 Adult ADHD-Focused Couple Therapy: Clinical Interventions, by Gina Pera and Arthur L. Robin (Routledge, 2016) – The first guide to ADHD couple therapy based on merging the principles proven effective for couple therapy with those of Adult ADHD treatment. In turn, these guides inform the comprehensive strategies in ADHD Success Training. This online training—one track for consumers and another for clinicians—provides a deeper and broader level of understanding. We offer a parallel training for professionals—and a new ADHD Professional Directory to help you find each other. 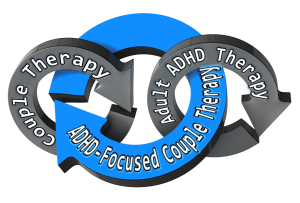 Understand the principles and strategies behind Adult ADHD-Focused Couple Therapy™ in order to work better with a therapist trained in these interventions? For thousands of couples in the U.S. alone—and perhaps even millions—the “ADHD piece” will provide the cornerstone to understanding, and healing, their previously intractable struggles. Downloadable excerpts on key concepts from Is It You, Me, or Adult A.D.D.? Regular opportunities for Q&A with the authors and other contributors to the book, including J. Russell Ramsay, PhD, who established a CBT/ADHD model for couples. Proceed at your own pace. Re-visit previous lessons as much as you like! 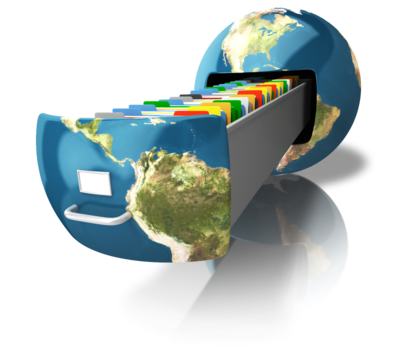 The online training is organized by topic and sub-topic, each generally 10-15 minutes long. These short modules make for a quick “refresher course” on a given topic. Moreover, you need not scan an hour-long (or longer) video or re-read dozens of pages just to find the section you need right then. For example, if you forget the chief purposes of the daily “check in” or the strategies around chore-sharing, you can review just that segment. 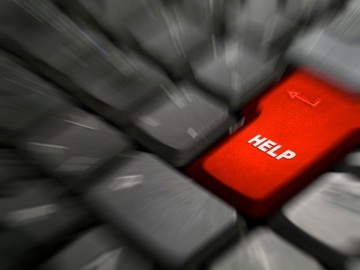 If you have an Internet connection and can access our site (some countries restrict Internet access), the courses are always at your fingertips. We will welcome your feedback and work to steadily improve the content and develop new material. With a combined 55 years experience, Gina Per and Arthur L. Robin, PhD, are respected experts in the field of Adult ADHD, particularly as it can affect relationships. You can learn more about our backgrounds at About the Presenters. You will find camaraderie and peer support through a variety of potential outlets—tele-chats, Google Hangouts, a private forum. Many countries do not recognize Adult ADHD. Yet, epidemiological studies indicate the prevalence is roughly the same worldwide. m We hope these courses serve participants who might otherwise lack resources and guidance. Consumers have grown rightfully wary of therapists who claim Adult ADHD expertise yet actually know less than their clients—or fail to recognize ADHD at all. For years, readers of Gina’s book have written to ask her for recommendations nationwide—and even worldwide. Having been in the same situation years ago, she knows first-hand how vulnerable these couples can be. They often hang preciously at the end of their ropes, following years of discord and attempts at marital therapy that failed to recognize ADHD. Sometimes, one or the other partner is willing to give it only “one shot.” Much rides on their selection of a therapist. This directory is designed solely for professionals having a significant specialty in ADHD—in children, teens, adults, and the elderly. Professionals are encouraged to include specific information about their approach to treating ADHD—including the models, books, and experts they rely upon to inform their practice. Professionals can provide consumers with an extra degree of assurance that they are familiar with Adult ADHD-Focused Couple Therapy™ principles. Each listing indicates if the professional has completed Level 1 and/or Level 2 of ADHD Success Training courses. Professional Level 1 training is available now. It is based on reading Adult ADHD-Focused Couple Therapy and passing a 20-question multiple-choice test (80% is passing). Expect Level 2 training for both professionals and consumers by late 2018. When the classes are up and running, participants will gain access to an online community of fellow students. Contact Gina for more in, via “Contact” at the top of any page. 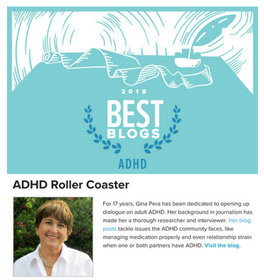 Since 2008, Gina has written a blog about all aspects of ADHD: ADHD Roller Coaster, and it has been named a Healthline “Top ADHD Blog” every year since 2014.